We started improvements of the detector and developments of observation technique in 1995 using the 300m interferometer gravitational antenna TAMA300 in Mitaka campus of the national astronomical observatory of Japan. 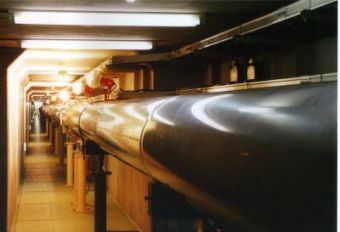 The aim of the project is to develop advanced techniques needed for a future km-sized interferometer and catch gravitational waves that may occur within our local group of galaxies. 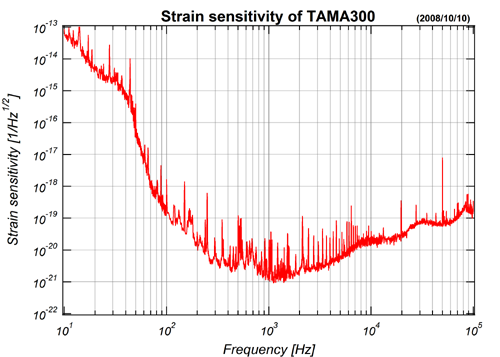 The present sensitivity of TAMA300 is h = 10-21 [1/Hz1/2] at 1kHz. It is possible to detect gravitational waves from coalescing neutron-star binaries in our galaxy. However it is considered that the event rate is once a few 100,000 year within a galaxy. In order to catch gravitaional waves several times a year, KAGRA(LCGT) with the sensitivity one hundred times better than the present one is necessary. TAMA adopts a Fabry-Perot Michelson Interferometer with recycling. We started installaion of a next genaration technique RSE.